First thank you to Margaret for a great challenge topic. I have to admit it was tough deciding what to do for this one! I often look thru my photo album for inspiration and I had a wonderful photo of a dandelion from a motorcycle trip hubby and I took last summer with some dear friends. We drove to the Alberta badlands to Dinosaur Provincial Park and as we entered the park there was a scenic lookout and my friend noticed this awesome dandelion. So I snapped a few pictures before we headed into the park. In my first plan I was going to put an original poem I wrote on this piece but decided against it once the piece was almost done. I also considered "Wish" since as a child we would make a wish then blow hard on the dandelion to "scatter" our wishes onto the wind. But along with those fond memories I could still almost hear our laughter. So I tried to use the words that would most sum up all of these feelings, hence Live Love Laugh. Hard to get a real detail shot so here is another picture. Simple words to live by. I know this posting is a bit early, but my life is about to get hectic and I didn't want to be late! Adding a word or words was a challenge. Picking just the right one. Why did I pick that one and not another, etc. My older brother, Bob, was born in February. He passed away in 2000, but as with everyone who is close to you and passes away, you think of them particularly on special days you celebrated with them. So last month, I thought of Bob a lot. Just before he died, he said, "Marg, I've figured out the meaning to life!" When prodded, he said, "Be." I have tried and tried to dispute this, but I always come back to "be". You can add descriptors, positive and negative, but when you take those away, you end up with "be". For the image to go with "be", I picked my garden Buddha. First, the background fabric was sandwiched and quilted. 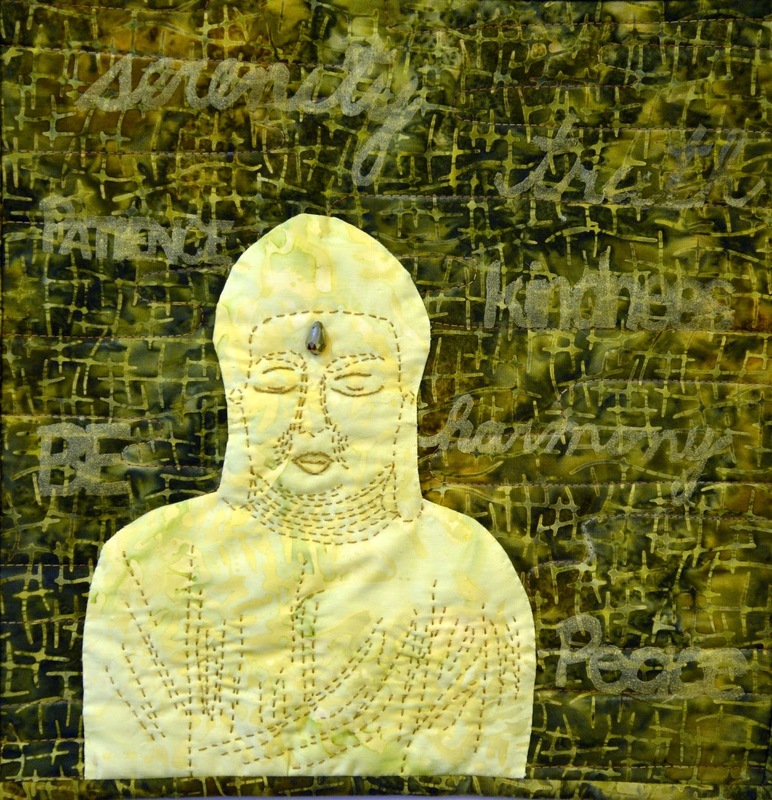 The Buddha was also sandwiched and hand quilted before hand appliqueing it to the background and before attaching the words Because I wanted the words to be very subtle, it might be hard to read them all! Sorry about that. I wrote or printed each word on paper and put the paper behind clear glass. I then ironed misty fuse onto the back of a piece of organza, taped it on top of the glass with the words underneath, heated up my cutting tool, and heat cut the words out making sure to have the words lift off the glass with no breaks between letters. To attach the words, I laid each on the background, covered it with parchment paper, and ironed it in place. The misty fused words are rather fragile because they are just ironed on - no sewing - hence they were added last. In case you can't make out the words, they are: BE, patience, serenity, truth, kindness, harmony and peace.